Student of the Year is a musical romantic comedy directed by Karan Johar for Dharma Productions and Red Chillies Entertainment. Main cast includes Sidharth Malhotra, Alia Bhatt, Varun Dhawan, Rishi Kapoor and Ronit Roy. Rahul is rich and has spoiled girlfriend Shanaya. But Rahul seeks Tanya. Abhimanyu is Rahul's friend. They all are in the same school and want to win the trophy of 'Student of the Year'. 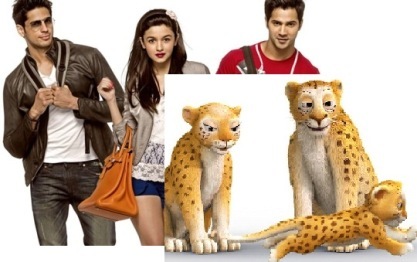 Delhi Safari is a 3D animation movie directed by Nikhil Advani and produced by produced by Krayon Pictures. Voices includes of Akshaye Khanna, Govinda, Suniel Shetty, Boman Irani and Urmila Matondkar. Delhi Safari is a journey of a cub leopard and other animals whose forest is on the verge of destruction. Their intention is to protest in front of parliament.